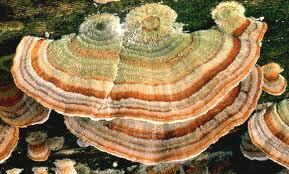 Coriolus Versicolor is also known as Turkey-tail mushroom, Tametes Versicolor, Yun Zhi (in Chinese), Karawaratake (in Japanese). Extracts of the mushroom are known as PSP (polysaccharide peptide) and PSK (polysaccharide K, or Krestin). In the 1980s, the Japanese government approved the use of PSK for treating several types of cancer and PSK is a best-selling anti-cancer drug in Japan as a complement to surgery, chemotherapy and radiotherapy. PSP was discovered more recently in China.